Xen provides couple of different networking options like bridge networking, nat networking and route networking. Bridging is a technique used for connecting different network segments. It is the default option for Xen networking as it simply connects all the virtual machines to the outside world through virtual network interfaces connected to the bridges created by Xen. 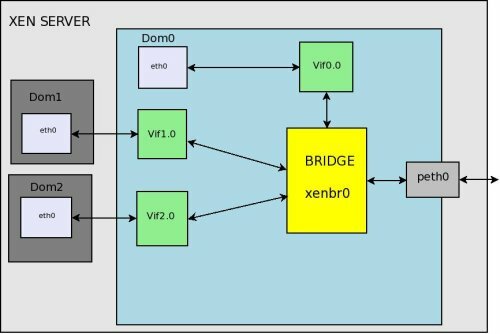 When using bridged networking, Xen creates a network bridge and then connects the actual physical network interface to this bridge. Virtual network interfaces are then created for dom0 and each of the guest domains; these are all attached to the network bridge. In this manner, all the domains can connect to any address to which the physical network interface can connect. In the Xend configuration file /etc/xen/xend-config.sxp, the default directives related to the virtual network are shown below. Notice that the network-bridge and vif-bridge lines are the only ones uncommented. These are the lines needed for bridged networking. The network script network-bridge is in the directory /etc/xen/scripts. It sets up the networking environment and uses the bridge-utils tool to set up the software bridge xenbr0. The vif script vif-bridge is also in the same directory as the network script. It sets up the backend vif for the guest domain when a guest domain boots up. Before creating any guest domains if you check the network interfaces in Dom0 by typing ‘ifconfig’ command, you can see an output like the following. You may be wondering how and when all these network interfaces are created. Here is the sequence of events that happen when you boot up your Xen server and xend starts up (only dom0 is started and no guest domains set to auto start by xend. I only have one physical network interface on my server and it is named eth0). For each new domU, Xen creates a new pair of “connected virtual ethernet interfaces”, with one end in domU and the other in dom0. For linux domU’s, the device name it sees is named eth0. The other end of that virtual ethernet interface pair exists within dom0 as interface vif<id#>.0. When a domU is shutdown, the virtual ethernet interfaces for it are deleted. So you would be able to see additional network interfaces after creating new guest domains. Here you can see the newly added interfaces vif1.0 and vif2.0 , which are virtual interfaces for the new guest domains created. Inside the guest domain, the network interfaces look the same as on a typical machine. In a guest domain, whether the Xen network is in bridging mode or routing mode, the network interface looks the same as it would in a nonvirtualized machine. Each DomU (guest domain) have a configuration file where we can specify the network settings associated with that domain. It is specified as the following in the corresponding configuration file. bridge: Specifies the network bridge that will be used for this interface. mac: Specifies the MAC address for this virtual interface. and what they mean. Next we can have a look at the packet flow in bridged networking. For that please refer the following figure. Packet arrives at hardware, is handled by dom0 Ethernet driver and appears on peth0. peth0 is bound to to the bridge, so its passed to the bridge from there.We can see that peth0, xenbr0, vif0.0, and vif1.0 are sharing the same MAC address FE:FF:FF:FF:FF:FF, which is the Ethernet broadcast address. This indicates that the physical interface, the loopback device of Domain0, and the backend interfaces of guest domains are all broadcasting to the bridge interface xenbr0. When the physical network interface receives the packets, it sends them all directly to the bridge interface xenbr0. Now the bridge distributes the packet, just like a switch would.The software bridge determines which domain’s backend interface to forward those packets to by the receiver’s MAC addresses. So, peth0 does not need to have an IP, only a MAC address. 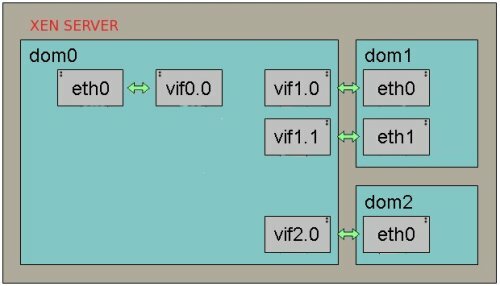 The vif interface puts the packet into Xen, which then puts the packet back to the domain the vif leads to.Its also done that way for dom0, hence the vif0.0->eth0 pair. If you want to use a bridge name other than the default one( xenbr0) you can specify it in the xend configuration file like the following. where <name> is the desired name of bridge. If a server has more than one physical network interface, it may be useful to separate traffic between interfaces by creating additional bridges. In this way, one could connect xenbr0 to peth0 and xenbr1 to peth1 and give a virtual machine in say dom1 exclusive access to xenbr1. Everything necessary for this is present in the network-bridge script.